Swing dance instructors across the country have adopted Swing It. for their beginner and intermediate classes. Music you MUST dance to whether you do or don't. 5. Was It A Dream? Patti O'Brien Melita grew up in New York's Capital District in a family of church choir and barbershop harmony singers. Although she studied classical piano and voice for several years, her real love proved to be traditional jazz. After singing in jazz and dance bands for a while, Patti took a hiatus from performing. It wasn't until much later that her new found friends discovered her talent and clandestinely entered her name on the program of a major dance festival as singing with a swing band. Even after an extended lapse in performing, Patti found herself right at home at the microphone. Since, she has been heard singing at festivals and swing dances throughout upstate New York and New England, delighting audiences with her oh-so-smooth and alluring voice. She was a long-time co-director of the celebrated Dance Flurry Festival which draws 5,000+ dance enthusiasts annually to Saratoga Springs and coordinated the DanceFlurry Organization's monthly swing dance events. She is an official consultant of all that is danceable at Falcon Ridge Festival held annually in Hillsdale, N.Y. Patti plays variety parts in musicals including Patsy Cline in a Legendary Entertainers' series and stars as one of the "Andrews Sisters" in the World War II musical "Songs That Won The War". She also plays one of the Cotton Club singers in the musical "Bourbon St. To The Cotton Club"
Aside from performing, Patti has supported live music in her community for many years. She was involved with the Collar City Live! concert series in her home town, Troy, N.Y., is an officer of the Swingtime Jazz Society, Inc. in the N.Y. Capital Region, is a member of A Place For Jazz Society in Schenectady, N.Y. and is Secretary-Treasurer of the Albany Musicians' Association, Local 14 AFM. 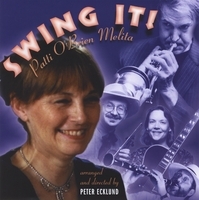 As a swing dance afficionado Patti's expertise on "music that motivates people to dance" enabled her to assemble a variety of material on her CD that defies the listener not to dance or at the very least begin the toe-tapping exercise. Together with producer Peter Ecklund, Patti recorded "Swing It! ", a collection of vintage tunes arranged for the most discriminating dancers and listeners. Patti sings jazz standards with a freshness and relevance that will make you hear these old songs with a new ear. She's assembled a stellar band that puts the groove back in groovy. So much so, that swing dance instructors across the country have adopted "Swing It" as music for their classes. It's music you MUST dance to, even if you've never danced before! The assembly of noted guest musicians appearing on "Swing It!" not only contributes to a distinctive and extraordinary recording but is a testimony to the respect Patti has earned among her peers. Patti will soon be working on a new album with her current band, Patti-O & The Hip Hooligans. Keep a lookout for it. Swing It! acheives it's innovative sound from this unique combination of talent. What they say about Patti Melita ! Pat Melita is a jazz vocalist with an uncanny knack for selecting the most memorable songs from the swing era and the skill to deliver them in a way that is both true to the period and up-to-date. Her compelling yet unaffected vocals reveal a deep love and understanding of the music.Pat's got the sound! Pat Melita has a rich, even voice, a sure sense of phrasing, and an ability to pick just the right tempo and the right song to keep the listeners and dancers swinging. Being a serious classical musician, I\'ve never been much into jazz or swing. This album changed all that for me. Pat\'s selections are really great and she has an even greater voice to pull it all off. My wife, who shares similar musical tastes as me, enjoys the album as well, and we will often put the CD on to lift up the spirit of our parties. You can\'t help move your feet with this one! Awesome!